Part 4 of a series about the development of the English novel during the eighteenth and nineteenth centuries. In this article I look at the reasons for the growth of women as novelists in the Victorian era. From Austen to Ann Radcliffe and the Brontes, and from Gaskell to George Eliot and Margaret Oliphant; women writers seem to have been a dominant force in the novel market in Victorian Britain. 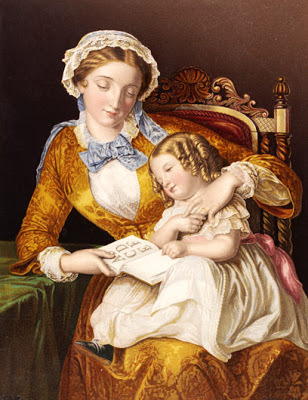 It’s remarkable that they made such an impact given the strength of feeling in the nineteenth century that the proper place for women was at home, looking after the children and the family’s comfort, not dirtying their hands with any form of work. Many of these women took up the pen because they needed the money. Who can blame them? There were few other options available, particularly for middle class women who were expected to maintain a certain respectability befitting their status. They could have, like the Bronte sisters, become governesses but such a prospect wouldn’t have been all that attractive. For one thing, governesses occupied an uncomfortable middle ground where they lived with the family and were intimate with their domestic rituals and yet were not really one of the family. As unmarried women they were expected to exhibit behaviour above reproach and beyond even the hint of wayward behaviour. I have just one word to say of the whole tribe; they are a nuisance. Not that I ever suffered much from them; I took care to turn the tables. The best fun was with Madame Joubert: Miss Wilson was a poor sickly thing, lachrymose and low-spirited, not worth the trouble of vanquishing, in short; and Mrs. Grey was coarse and insensible; no blow took effect on her. But poor Madame Joubert! I see her yet in her raging passions, when we had driven her to extremities—spilt our tea, crumbled our bread and butter, tossed our books up to the ceiling, and played a charivari with the ruler and desk, the fender and fire-irons. Faced with that kind of daily torment, it’s not surprising that some women chose instead an occupation that could be pursued quietly and without the need for them to leave home. They could even write while rocking the baby’s cradle. Unlike poetry, the novel genre was also more accessible to those without a classical education since it wan’t considered to be of the same high literary status. “I carefully avoid any appearance of pre-occupation and eccentricity which might lead those I live among to suspect the nature of my pursuits….. I have endeavoured not only attentively to observe all the duties a woman ought to fulfill, but to feel deeply interested in them. That last phrase may hold a clue as to why the output of women’s writing proved to be so popular. As the idea of the new ‘realist’ form of fiction took shape, ordinary domestic lives and settings became of greater interest – and who better able to understand and convey that domestic dimension than those for whom home and hearth was considered their natural milleu? It was a subject on which they could speak with natural authority acknowledged by both men and women readers. Provided they stayed within that space, their literary efforts would be socially accepted and even esteemed. But woe betide those like Mary Wollstonescraft who stepped outside those boundaries and refused to be confined within the moral, domestic and emotional perimeters of their allotted sphere. Such writers found themselves on the receiving end of severe criticism and condemnation. Posted on March 6, 2013, in History of the novel and tagged Charlotte Bronte, history of the novel, Jane Eyre. Bookmark the permalink. 4 Comments. Oh thank goodness I don’t have to endeavor to observe all the “duties of a woman.” I’m not sure I could convince anyone I was deeply interested in them. I would have been a very poor Victorian. I do like children, occasional ironing, baking, clothes and gardening. My husband does most of the cooking. Housekeeping is not my forte. I tend to have a little nest of books and papers around me most of the time.